(Nanowerk News) A team led by University of Wisconsin-Madison researchers has developed a new approach for creating powerful nanodevices, and their discoveries could pave the way for other researchers to begin more widespread development of these devices. The discoveries were published in the online edition of Nature Materials on February 28. 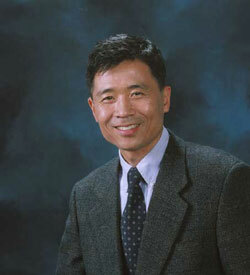 Chang-Beom Eom, a professor of materials science and engineering, leads the team, which includes UW-Madison graduate students and research associates and collaborators from Penn State University, the University of Michigan and the University of California, Berkeley. Particular metal-oxide materials (including some ferrites) have a unique magneto-electric property that allows the material to switch its magnetic field when its polarization is switched by an electric field and vice versa. This property means these materials can be used as bases for devices that act like signal translators capable of producing electrical, magnetic or even optical responses, and the devices can store information in any of these forms. This could produce a variety of magnetoelelectric devices with a wide range of applications, such as new integrated circuits or tiny electronic devices with the information storage capacity of hard drives. “We all have electric and magnetic devices that run independently, but sometimes we want these functions integrated into one device with one signal used for multiple responses,” says Eom. Essentially, Eom and his team have developed a roadmap to help researchers “couple” a material’s electric and magnetic mechanisms. As researchers run a current through a magnetoelectric device, electric signals follow the electric field like a path. The signals’ ultimate destination could be, as an example, a memory “bank” operated by a magnetic field. When the researchers switch the electric field, the signals encounter a fork in the path. Though both prongs of the fork head in a similar direction, one path is the correct one and will prompt the magnetic field to switch. This will allow the information carried by the signals to be stored in the bank. If the signals take the incorrect path, the magnetic state won’t switch, the bank remains inaccessible, and the information is lost as soon as the electric field turns off. In addition to determining the proper path for the electric signals, the team has developed a matrix that ensures the cross-coupling effect is stable, or non-volatile, which allows for long-term data storage. This matrix is then embedded in thin films. These two discoveries — the correct path and the stabilizing matrix — will allow other researchers to study the fundamental physics of cross-coupling in materials and begin investigating how to turn the many possibilities of multifunctional devices into reality.